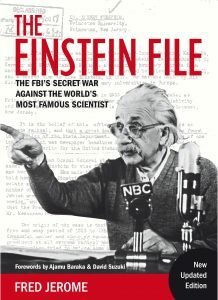 (Montreal, 5 Feb. 2018) – Celebrated novelist Thomas Pynchon has kindly read and lauded Fred Jerome’s The Einstein File, The FBI’s Secret War against the World’s Most Famous Scientist to be published in a new updated edition on May 1. The new edition of The Einstein File, first published in 2002 by St. Martin’s Griffin of New York, contains a 25-page author’s update. Since the book first appeared, Fred Jerome has pursued his research and published two other books on Einstein and his political activism, particularly in opposition to racism but also in opposition to political Zionism and the founding of a Jewish State. Ajamu Baraka and David Suzuki have written forewords to this edition. Ajamu Baraka is a grass-roots organizer and educator and was the Green Party’s nominee of Vice President of the United States in the 2016 election. David Suzuki, a Canadian geneticist, broadcaster, and environmental activist, is a unique figure in science and television.